I know I don't say it or or show it or even feel it enough (in fact more often than not, I'm muttering under my breath about how I just want to left alone), but I am incredibly thankful for my family and my welcoming home. Six years ago, getting a Thanksgiving day pass from the rehab was one of the first steps toward getting me home for good. I was reminded of my good fortune a couple of times this week. First, I was doing a "peer visit" at the rehab -- with a man who strikingly resembled me as a patient (helmet and all) -- and was thrilled to witness he and his wife receiving that good news of a Thanksgiving pass of their own. Even more jarring perhaps, was a visit I and a couple other members of Brain Injury Voices took to a newly-formed brain injury support group at a nearby out-patient rehab. In the audience was my last roommate at the rehab. I think I had four in total; and he was the only one to outstay me, despite or possibly because of his insistence that he didn't need to be there. Unfortunately, we didn't get to talk, and I don't know if he remembered me; but it seems that he now lives in a group home for people with brain injuries and comes to this rehab during the day. Jordan [not his real name] was in his late 30s when we met, was divorced, a former nurse, and would receive regular visits from his mother and sister, neither of which were in a position to take him home with them. 2010 was his second stay at the rehab, after having suffered two strokes in 2008. In 2010 he had a seizure that brought him back, because it was unclear whether he was able to properly keep up with his anti-seizure medication. So, IF...: if I had not chosen a sedentary career at a well-established corporation with excellent benefits and a vested dedication to its employees; if I had not been married and settled into a fairly reliable and navigable house; if my parents were not gainfully retired and healthy; basically, if I had not planned my life so perfectly around having a debilitating illness at 40; if I had not kept up with my meds when I had my seizure in 2012, I most certainly could have been Jordan, sitting patiently and listening to some bozo 's pseudo-inspiring drivel about how hard work, patience and creative strategizing pay off. So I am very thankful for everything I have, including the stupid brain that got me here. 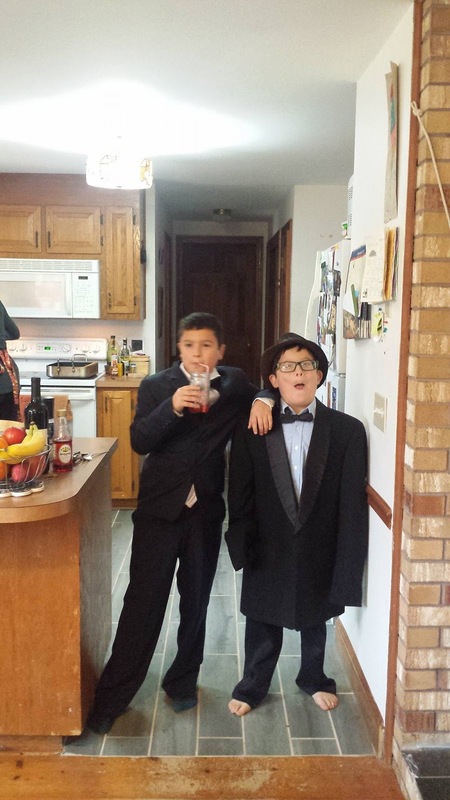 The boys dressed up for Thanksgiving 2016, Wyatt in his cousin's old suit and Gus in my old tuxedo jacket that never quite fit me and never will again anyway.